In our previous article in this series, we looked at how we might go about setting up a nuget server. With that all done and dusted, it’s on to actually creating the libraries ourselves. Through trial and error and a bit of playing around, this article will dive into how best to go about developing the packages themselves. It will include how we version packages, how we go about limiting dependencies, and in general a few best practices to play with. An obvious place to begin is what framework to target. In nearly all circumstances, you are going to want to target .NET Standard (See here to know what .NET Standard actually is). This will allow you to target .NET Core, Full Framework and other smaller runtimes like UWP or Mono. The only exception to the rule is going to come when you are building something especially specific for those runtimes. For example a windows form library that will have to target full framework. Your libraries should be built in such a way that someone consuming the library can use as little or as much as they want. Often this shows up when you add in dependencies to your library that only a select people need to use. Remember that regardless of whether someone uses that feature or not, they will need to drag that dependency along with them (And it may also cause versioning issues on top of that). Let’s look at a real world example. Let’s say I’m building a logging library. Somewhere along the way I think that it would be handy to tie everything up using Autofac dependency injection as that’s what I mostly use in my projects. The question becomes, do I add Autofac to the main library? If I do this, anyone who wants to use my library needs to either also use Autofac, or just have a dependency against it even though they don’t use the feature. Annoying! Doing this means that anyone who wants to also use Autofac can reference the secondary package (Which also has a dependency on the core package), and anyone who wants to roll their own dependency injection (Or none at all) doesn’t need to reference it at all. I used to think it was annoying when you searched for a nuget package and found all these tiny granular packages. It did look confusing. But any trip to DLL Hell will make you thankful that you can pick and choose what you reference. It’s worth noting that while many Microsoft products use a 4 point versioning system (<major>.<minor>.<build>.<revision>), Nuget packages work off whats called “Semantic Versioning” or SemVer for short. It’s a 3 point versioning system that looks like <major>.<minor>.<patch>. And it’s actually really simple and makes sense when you look at how version points are incremented. <major> is updated when a new feature is released that breaks backwards compatibility. For example if someone upgrades from version 1.2.0 to 2.0.0, they will know that their code very likely will have to change to accommodate the upgrade. <minor> is updated when a new feature is released that is backwards compatible. A user upgrade a minor version should not have to touch their existing code for things to continue working as per normal. <patch> is updated for bug fixes. Bug fixes should always be backwards compatible. If they aren’t able to be, then you will be required to update the major version number instead. We’ll take a look at how we set this in the next section, but it’s also important to point out that there will essentially be 3 version numbers to set. I found it’s easier to just set them all to exactly the same value unless there is a really specific reason to not do so. This means that for things like the “Assembly Version” where it uses the Microsoft 4 point system, the last point is always just zero. 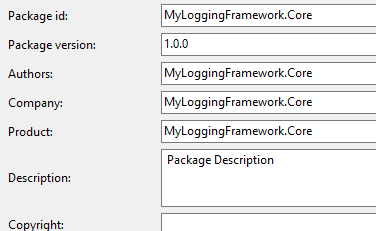 In Visual Studio if you right click on a project and select properties, then select “Package” on the left hand menu. You will be given a list of properties that your package will take on. These include versions, the company name, authors and descriptions. If you edit the csproj directly, then head back to Visual Studio properties pane to take a look, you’ll see that they have now been updated. The most important thing here is going to be all the different versions seen here. Again, it’s best if these all match with “Version” being a SemVer with 3 points of versioning. For a full list of what can be set here, check the official MS Documentation for csproj here. If we use the example solution above in the section for “Limit Dependencies” where we have multiple projects that we want to publish nuget packages for. Then we will likely want to be able to share various metadata like Company, Copyright etc among all projects from a single source file rather than having to update each one by one. This might extend to version bumping too, where for simplicity sake when we release a new version of any package in our solution, we want to bump the version of everything. By chance I had heard about a feature of “importing” shared csproj fields from an external file. And as it turned out, there was a way to place a file in the “root” directory of your solution, and have all csproj files automatically read from this. The first step is to create a file called “Directory.Build.props” in the root of your solution. Note that the name actually is “Directory”, do not replace this for the actual directory name (For some stupid reason I thought this was the case). And by magic, all projects underneath this directory will overwrite their metadata with the data from this file. Using this, we can bump versions or change the copyright notice of all child projects without having to go one by one. And ontop of that, it still allows us to put a description in each individual csproj too! The hardest part about all of this was probably the shared assembly info and package information. It took me quite a bit of trial and error with the AssemblyInfo.cs file to work out it wasn’t going to happen, and surprisingly there was very little documentation about using a .props file to solve the issue. The final article in the series will look into how we package and publish to our nuget feed. Check it out here!